Our friendly staff is always ready to make your stay enjoyable. The Shamrock Inn is always happy to welcome your whole family. An oasis of comfort while you are away from home. 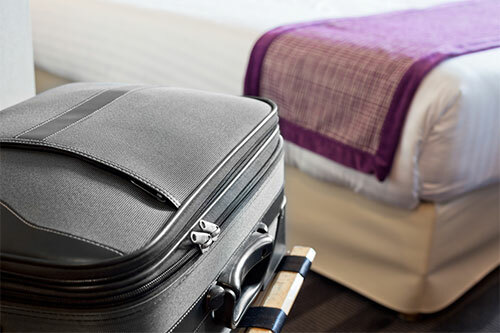 Enjoy your stay in clean comfortable rooms designed to help you relax while on your travels. 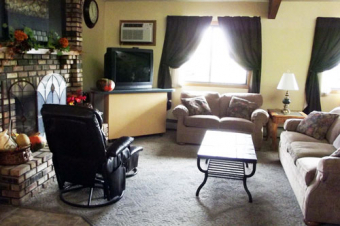 Each room at the Shamrock Inn of Hutchinson is cleaned daily. Solid concrete construction provides you with superior privacy, you will not be bothered by the chatter of conversations or television shows being viewed by your neighbors. You are Connected! We provide you with access to our guest WIFI network at no additional charge. Access our wireless guest network to surf the web, work online or make phone calls using your laptop, smart phone or other wireless capable devices. Conveniently located within walking distance of the Hutchinson Mall, Target, Wallmart and a variety of popular restaurants. 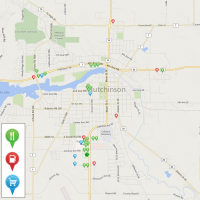 Hutchinson is a comfortably sized community with the "small town" atmosphere. There are plenty of stores, parks and other recreational activities all within a five minute drive of The Shamrock Inn hotel. The Shamrock Inn Hotel offers a large variety of Amenities. Our goal is to make your stay comfortable and happy. If there is anything you need let our friendly staff know and we will do everything within our means to accommodate you. 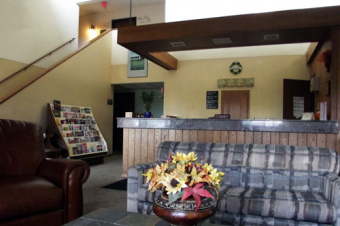 Enjoy the comfort of our single bed rooms located in the Shamrock Inn of Hutchinson. Wake refreshed and enjoy a complimentary breakfast served in our lobby. Plenty of room for up to 4 occupants in the cozy comfort of The Shamrock Inn's double. Spread out over two queen sized beds, relax and get a good night's rest. Looking for a bit more than a place to spend a night? Our full suite comes with a small kitchenette allowing you to cook meals in the privacy of your room. The hide-able bed allows you to use the room as a meeting room. It is versatile and efficient when traveling for work. Spacious and comfortable public area for relaxing or visiting with friends. You will be greated by our friendly staff at our front desk. 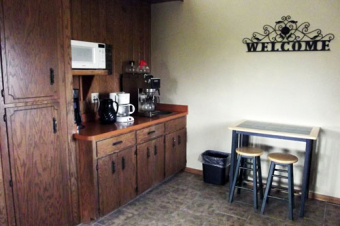 Each morning you are welcome to mingle with other guests as you enjoy a free continental breakfast. 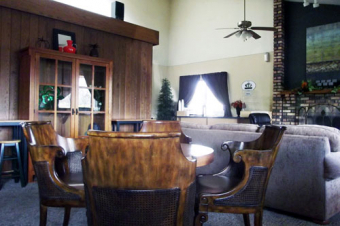 A cozy sitting area that offers you plenty of room to sit back while enjoying a fire in the fireplace. 2013 - 2019 Copyright © All Rights Reserved, Shamrock Inn Hotel.